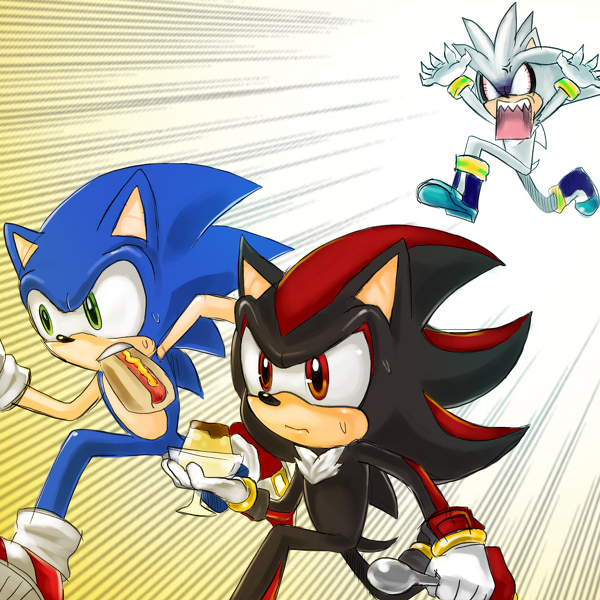 sonic and shadow steal silvers pudding!! xD. . Wallpaper and background images in the Silver the Hedgehog club. RUN RUN SHADOW AND SONIC RUN!!!!!! umm... has sonic got a hot dog in his mough or a corndog? It looks more like Flan. Give Silver back his pudding, Shadow! ...And Sonic and Shadow better look out!!! That's because it is Flan. I DONT KNOW WHAT THE HECK FLAN IS!!!!!!! Lol that's mah homedog!!! Gettem silver gwttem!!!! Silver: GIVE... ME... BACK... MY... PUDDING!!!!!!!!!!!!!!!!!!!!!!!!!!!!!!!!!!!­!!!­!!!­!!!­!!!­!!! so nic,shadow run.run like the wind!!! I would be angry if someone stole my jelly. Me: Gimmie back my jelly you b**ch! lunia: GAH! *whack shadow with hammer and give silver his pudding back* :3 ur welcome. id be angry if someone stole my steak. WOw!! THis pic has 31 COMMENTS!! this ROCKS! Flan is some kind of dessert. And it actually looks like chocolate dipped pound cake. That's like me and my two brothers. Execpt instead of food, they have one of my books torn in half. One half in each hand. Aw dat stinks! Sounds like my 6yr old sis! Now I know I may sound weak havin a 6yr old take my food, vgames, hw, etc, etc. But she's evil! & she just happens 2 b da tallest kid in her kindrgartn class which is only bout a head shorter Dan me! Mayb 2 I'm not THAT short & she is strong! & very sneaky! I know how u & Silver feel! shadow run! shadow run! sonic run! sonic run! If that's what Silver is like when someone takes his flan off him, what would he be like if someone took his bubble wrap off him. I know I'd go balistic! Silver: -tear agngryfacewail- "GIVE ME BACK MY SNACKS!" silver: GIVE ME BACK MY PUDDING !!!!!!!!!!! sonic: MY CHILE DOG !!!!!!!! omg. lol this is really funny . sonic: i knew this was a bad idea, thank god i have my hot dog. Me: How is Silver keeping up with them? Isn't he the slowest character in the series? I would turn super if someone stole my pack of Oero cookies.I would be like,''GIMME BACK MA PUDDING,MOTHAFUKERS!